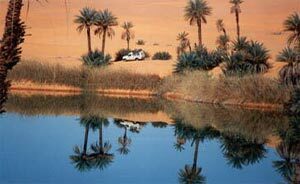 While your tour around Fezzan region, we advise you to visit the famous Ubari lakes - Gebraoun, Mandara, Umm al-Maa, and Mavo - surrounded by palm trees and sand dunes. It's just one hour away from Germa, the ancient capital of the Garamantians, one of the most significant archaelogical sites. Lakes water therapy responds to the demands more and more identified with the increase in stress and in various feelings of general discomfort of modern life. As a matter of fact, the benefits of Saharian lakes water have been well known for centuries and those from various cures of natural therapy have been confirmed by specialists all over the world.